Sidi even said in this Malaysiakini extract ,” Munan also said he believed Masing was behind what Beginda did and that he (Masing) had over-played his hand in the conspiracy clearly directed at Taib and Jabu.” To me,enough of all this dirty linen being thrown out in the open. The politics we faced today are not of yesteryears where even a small knife at the back will hurt until the person goes into a frenzy. The allegations,counterlies makes PRS look “CHEAP”. If the numbers are there and if the armies are willing to fight it all out even “a mighty storm” would not make the Party shudder let alone run for cover. A politcal watcher said,”You know,when all the hoo haa’s were happening and the immediate takeover by Pakatan was at a richter scale of 9 and above what did CM do? Did he make trips after trips to KL? No,no,no he knows where his peoples allegiance are? He could even be relaxing in his HOT BATH puffing his Cuban cigar and reading Sun Tzu’s Art of War. That is the confidence he has and thats why there is also a statement from a Sabahan,” “Sarawak leaders have long been noted to be more shrewd and politically smarter than those in Sabah. Which is why Dr Mahathir was not able to bully them.” SO PRS members do we need to harp on the subject of bullying and fall into the trap of MCA? Of course not , and we need to make our own STAND..!! 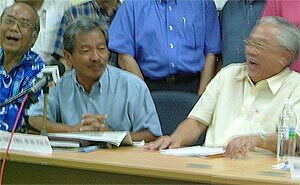 I do feel for Sidi,” as he was replaced and dismissed by James Masing as Secretary General in 2006′ which led to PRS being torn down in between to two camps. Now its an oppurtunity to fight back and thereby these words in the Malaysiakini extracts,” The wrong-doers must be duly punished,” he said, adding that members of either factions in the party who are innocent must be identified and thereby exonerated“He added that a thorough probe on Beginda’s accusation must be carried out so that PRS would not be a suspect. Why..? Hasn’t the CM said STOP IT!! According to a source CM will say his piece in the State Barisan National meeting behind closed doors and he will make sure that his WORDS ARE FOLLOWED. Does these words needs to be said to those unfamiliar to the MING COURT 1987 ,” Remember who said in 1981 that the chief minister was a weak CM?, he asked, adding that there must therefore be investigation ‘before another Ming Court coup rears its ugly head again.’ All is well Sidi and we know how to read the situation says a party member. PRS does not want to be a “TROJAN HORSE”. We have done it once too often. We only need to tell our YBs and MPs that they must not forget who thier bosses are. Its the PEOPLE and they will vote them out if the legislators forget them. We do not need to tell the BN and Pakatan Assemblyman and Members of Parliament that their salaries and titles are from the people and as such the politiking for positions inside their own parties should not deter them from going to the ground and serve their constituencies. The people now are street smart and the globalised world has made our voters smarter and no more ignorant of the REAL WORLD OF POLITICS. Why is PRS members coming out in the open.? I say it again “Is the HIDDEN HAND PUSHING HIS LUCK..? Is the agenda more than just pushing the blame to James Masing.? ” Tell me not to post some articles is quite reasonable but not when there are threats of “Don’t MIX with BULLIES“. Who are they to dictate who I go round with and What right do they have? To those who thinks that our Batu Lintang division of 1300 members strong are going to just cave in to these threats please ‘WAKE UP” and “BE REALISTIC.” Your armies will know when the COMMANDER and GENERALS performs or not. My late grandfather will say,”DON’T BE JEALOUS AND ENVIOUS OF OTHERS’.”WELCOME TO THE 21st century politics my friends. Build your own armies before you get thrown out and be irrelevant. Read and Studied Closely Sun Tzu’s Art of War lately..??? Is it happening in Sabah too? Who is the bigger bully? Pairin or Harris? The headlines in local dailies in recent days speak for themselves: ‘Amused by our double-standard politicians’, ‘Sapp should contest in Labuan to prove it’, ‘Time right for more Sabahans in federal posts’, ‘Harris’ bully claims have basis’ and ‘Just who bullied who?’, are among the more memorable ones. Natasha says,Machiavellian politicians are not frightened of crisis. A crisis is an oppurtunity.As Malays would say,”dalam kesempitan ada kesempatan”(there is an oppurtunity in a crisis) Of course there are other philosophies in politics and good politicians always back the winner.Losers must be avoided like the PLAGUE.Good politicians never swim near SINKING politicians. So we picked this up from Malaysiakini,” J/Z from Lagud wrote in another local daily that “Sarawak leaders have long been noted to be more shrewd and politically smarter than those in Sabah. Which is why Dr Mahathir was not able to bully them. We should learn from our neighbour Sarawak which has progressed tremendously without Umno. Who is Beginda and has he really ruffled the CMs feathers? Taib the Chief minister and State BN Chairman was asked to comment on a Malaysiakini report on saturday which quoted Parti Rakyat Sarawak (PRS) Balleh publicity chief as saying that UMNO at the federal level and PBB in Sarawak were too dominant and bullying other smaller BN components. So WHY Beginda and WHO is he.? If I may extract from another blog Borneo Warrior. ” Baginda,apai Basel,or more aptly “Tubai Kara” is one in a million stand alone Iban.You really have to know Baginda to really admire this guy. Beginda has only spent three years in school until Primary 3 but he speaks the Queen’s English.Dato Sri Dr James Masing,(also a close friend of his) told us several times”If had Baginda attained education up to Primary 6,we all would have been jobless”! Baginda rubs shoulders with federal and state ministers, MPs, ADUNs, UMNO politicians and businessmen.He is on a first name basis with members of Anwar Ibrahim’s family. His former boss Dato Sng Chee Hua was stunned when he was whisked away by the British Immigration and put on the next flight back. He flew first class with Sng on SIA, arrived at Heathrow, London and got arrested by The British authorities for giving a wrong answer to a routine and standard question thus: “welcome to London,sir” Baginda answered”Thank you, tuan”,What? You are on vacation? No, Baginda said.”I come to work here for my boss”. Work permit papers,please sir,the officer politely asked?Baginda smiled and did not respond. Obviously the authorities thought he was being funny and cheeky and sent him home on the next available flight. Try putting all the pieces together and see where it will get you. Talk of the town is that there seems to be an alliance again of Sng and James in the same camp. Impossible!! Nothing is Impossible in politics as Friends becomes Enemies and Enemies becomes Friends. I even got an sms from a former supreme council member of PRS to get as far away from the “bullies.” Is he serious..? I have not been kept in contact with him for almost five months and suddenly this sms.It’s very peculiar and also word has it that they are going all out against the deputy CM who is an Iban too. Any reason..? You should be able to answer this puzzle.Sun Tzu’s Art of war will give you some indications. So all is not too well in Sarawak and the BN will need to be on its toes as the Pakatan group is making inroads into the interior and Iban hinterland. 1987 was very close but then there was only 48 state seats. Today the Sarawak State has 71 constituencies. It is not impossible says the deputy PKR State Chief Baharuddin Mokhsen to audie61 but they need to work and strategise well. The finals between BN and Pakatan will be on 2011.Between now and then many more words will be exchanged. The local tabloids are having a “political field day” and it is Beginda Minda who has ignited it. Beginda had sent a statement to Malaysiakini news portal last saturday in which he gave two so called examples of PRS being bullied by UMNO and PBB. PRS Balleh Division Deputy Chairman Wilson Ugak said that Beginda Minda is no more the Publicity Chief of the division and he has been replaced by Tuai Rumah Garie Timbun who is also serving the PRS Balleh division service centre. Wilson also said that the statement sent by Beginda to Malaysiakini was also not the stand or view of the party. He also said during their recent AGM ,Beginda was replaced by Garie. A phone call was made by audie61 to Beginda who is in Kuala lumpur to seek clarification. Yes,yes,yes I am “Bekas or Former” Publicity Chief of the division. It must also be noted that according to the PRS constitution as Publicity Officer of the division, he is responsible to manage and publicize information regarding the policies,manifestoes,programmes and activities of the party at the Divisional level. a) After consultation with the division Chief or the secretary of the division to prepare all division’s press statements,manifestoes and other communications and the distribution thereof to such persons or body of persons as he considers suitable. b) To be responsible for the preparation and publication of the division’s newsletters and its distribution. Therefore other BN component parties should not be too worried about such a statement and its very CLEAR and the constitution has protected Parti Rakyat Sarawak (PRS) president Dato Sri James Jemut Masing. As for Beginda’s statement he will be investigated and dealt according to PRS constitution Article V using the laws as provided for. It was a chance reading when I came across an article which had Sir Alex Ferguson the Manchester United Supremo talking about “Bullying’ in prayers and secrets. The other headline news is of course the Malaysiakini report http://www.malaysiakini.com/news/91979 More cases of bullying by PBB in which “The Sarawak Barisan Nasional (BN) is abuzz like a hornet’s nest that has been disturbed, following an accusation that Parti Pesaka Bumiputera Bersatu (PBB) has been ‘bullying’ component parties. Another claim or is it that someone is cashing on to get the MUCH NEEDED PUBLICITY? The groundswell is of course to get on the “GRAVY LADEN TRAIN” and get on BN’s back and to get more support for Pakatan. Are we seeing Masing and Sng putting differences aside and teaming up again.? POLITICS ANYTHING IS POSSIBLE. We can now see two information chiefs from both camps pushing the BOOT IN at PBB. One is Beginda Minda from Balleh which is James Masings own division while Nanta Chaku is from Simanggang which is a former MP Jimmy Donalds division. Its very provocative says the Chief Political Secretary to the CM YB Karim Hamzah and he is monitoring the situation very closely. 1. Since 1981 other component parties in the Sarawak BN have been required to send two to three names of candidates for each constituency held by them, for the PBB leadership to pick the ones to contest. In other words, the final selection is subject to PBB’s decision. 2. A certain high-ranking Iban personage in PBB who fancies himself as the paramount chief of the (community) always insists on appointing his favourites as Penghulus, Pemancha and Temenggong (even) where PBB does not have elected (representatives). Another BN YB says what the HELL is happening? How come PRS members are coming out in the open.? Is the HIDDEN HAND PUSHING HIS LUCK..? Is the agenda more than just pushing the blame to James Masing.? Could it be just like what i came across on Sir Alex Fergusons ‘Bullying”. It has been said that Ferguson doesn’t open up to the media much these days. Why should he be..? Sir Alex has build a solid foundation in Manchester United. He says the older he gets, the more frightened he is of retiring. But there will come a time when he has to clear his desk and someone else will take over.” It seems that most of PBB grievances are taken out at Taib and his uncle Tun Rahman now. The bitter pill was the coming together of the two men which caught many by surprise and it was not even in the script. Of course it has been planned and the Sandiwara is for the Dynasty to go on. Pakatan will obviously capitalise on this and they will politicize the issues on hand to their advantage. The following statement by Nanta will add to BN’s woes. Bully or not there needs to be a STOP somewhere. Some solutions will obviously be found and it is up to BN not to be held up as a HOSTAGE in this political climate. Pakatan will find ways to up the ante and arouse the sentiments of the people in the NEED FOR A CHANGE to wrestle the State from BN. What a BULLY WEEK it has been…………….. The local tabloids have taken up the story of PRS:UMNO is a bully and so is PBB which appeared on Saturday 25th of October with the full text at http://www.malaysiakini.com/news/91917 . In the full email version Beginda Minda did not minced his words and it seems that there was a “HIDDEN HAND” behind all these. Why Provoke a situation and its the same like the recent spat between the German Millionaire Footballers of Ballack,Kuranyi,Frings against the German National Coach Joachim Loew. There are INDEED certain rules to follow and if you are part of the coalition whether it is BN or Pakatan it must be adhered to. This phrase,”how can you chop off the hand that feeds you. ?” takes a significant meaning. Beginda Head of publicity is from the Balleh Division,Kapit Sarawak (N56) Parti Rakyat Sarawak (PRS) has described Umno at the federal level and Parti Pesaka Bumiputra Bersatu (PBB) in Sarawak as ‘too dominant’ and indeed are ‘bullies’ in their dealings with smaller component parties in the Barisan Nasional. The spin miesters in and around Sarawak are saying that James is having a fall-out with Taib. Word on the ground is that he has even directed and was instrumental in asking Beginda to do it. 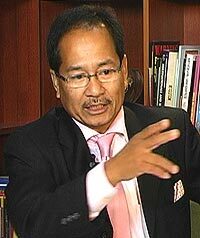 Moreover he was being pitted to be the next “Ketua Menteri Sarawak” as Pakatan will wrestle the State from BN. Who else will be the IBAN leader who fits all the criteria to lead Sarawak? James and nobody else of course says a political analyst. These are the POLITICAL ASSASINATION METHODS being deployed to check the threat James has on Taib. A point of CLARIFICATION here is needed as we say,”IT IS ABSOLUTELY RUBBISH AS JAMES IS BEING MADE THE SCAPEGOAT” “TRUTH BE TOLD” Before we go further this is what transpired between Beginda and audie 61.The telephone call made to Beginda on the day of question says it all,”I asked are you doing it on your own capacity. He said yes,yes yes. On another note WHO IS BEHIND IT.? Did Datuk Sri James ask you to do it? No,no,no this is the truth he said. WHY you do it? Thats the truth and I got nothing to hide. Anyway I am doing this willingly. Of course later,all HELL BROKE LOOSE. According to the tabloids it is learnt that James is planning to place a ‘GAG ORDER” on all members to prevent them from making statements which could jeopardise the party as well as straining its ties with BN.”In relation to what has been said in a blog(Malaysiakini) on Beginda’s statement Masing said,” We will investigate it and if we find that it is personal then we have to tell him off and also advise him not to do it.” although it is personal,it is still regrettable that he had made such statement.” This Statement is also not the STAND OF THE PARTY. We say,whatever the spin miesters has concocted a cocktail for Parti Rakyat Sarawak to DRINK it smells too disgustingly stinky we say, worse than a SKUNK ODOR to even contemplating of lifting it near our nostrils. Seems that the ” WORLD MARKETS SLIDE “ today has taken most of the “SHINE” of the UMNO Elections race. Moreover Malaysians would have been celebrating Deepavali a joyous occassion for the Hindus. Malaysiakini report has the latest UMNO race http://www.malaysiakini.com/news/91968 and it really looks BLEAK for Tengku Razaleigh as he has yet to obtain a single nomination from the party’s 191 divisions to contest the president post. Why is this so? It is a rallying call for UMNO to ensure that the succession plan for the No.1 posts is upheld and the divisions involved are following orders and instructions. Whats next for Tengku? Sad though but he still says that he will make it. WE ASK FROM WHERE..?? As of 6pm today, the divisions that had held their delegates meetings today all nominated the Najib for it, bringing his total nominations to 102 so far. When is Tengku going to break the EGG? Only 89 divisions more have to hold their meetings, which must be completed by Nov 9. Tengku must have known that his POLITICAL SHARES VALUES has nosedived but he still will not withdraw from the race and face further humiliation. Tengku said,””I’ve stated from the beginning that I’m only offering myself to contest for the post and at this stage, it is not a contest.It is up to the delegates to elect anyone qualified but I am urging the delegates not to be afraid of making a decision because it will determine the party’s future.” Very BOLD WORDS INDEED but the Divisions and delegates concerned have not taken the cue. Party contests are even harder than going to the rakyat to seek a mandate. The party members sees who they want to represent them and bring the party forward.Though a bit of GOODIES might be the order of the day before BUT now with UMNO in a dire need for leadership the CANDIDATES CREDENTIALS are under scrutinized more than ever. The CHOICE of the President and the UMNO hierarchy will either make or break the party as ALL will be revealed in the next General Elections. It’s the party members choice and they know what is BESTS for their PARTY.